This posting however is focusing on the one at St Cecilia’s Primary School on London Road (between Clarkes Ave and Langley Ave). St. Cecilia's turns 75 this year (that’s the school, not St. Cecilia herself, who I believe would be getting closer to a sprightly 1800 if she were still with us in body today) and in celebration, the school is having a specially themed 75th Anniversary summer fair. As you can see from the list above there will be many of the usual and a few less usual fair type attractions on the day. I only found out recently that St. Cecilia is the patron saint of music (something very special to my heart) and I am glad to see that there is some Karaoke happening on the day. (This link is entirely of my own making and I may just be finding significance where none exists.) And as a possible antidote to this, there is an ‘amazing silent auction’ however that may work. Either way the Parents and Teachers Association has prepared a very attractive programme and hope to have as many visitors from the area as possible. 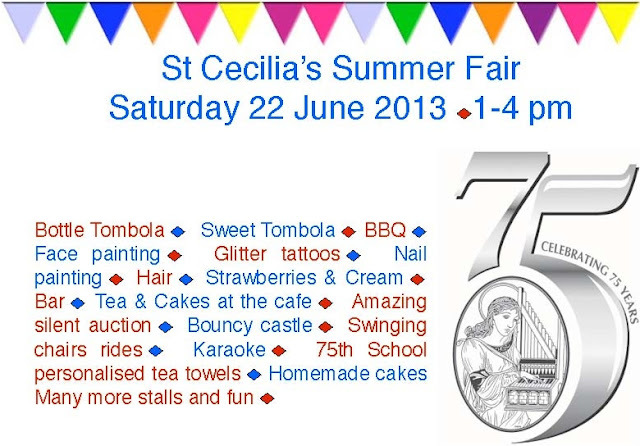 The St Cecilia’s fair starts at 1pm and finished at 4pm this Saturday the 22nd of June.